The year is not starting out as well as I had hoped. Back during the beta test of the CC-20 I had set a goal to complete my revisions and be ready to sell production kits by 1 January 2012. Obviously that date has come and gone and I’m still not on the market. A few circumstances have contributed to this situation. First, the days available for me to work exclusively on Etherkit has been cut from 4 per week to less than 2 due to family member’s work schedules being changed. Second, it took me longer than expected to tackle the bugs in the CC-20 beta; the worst being the high number of spurs in the receiver. So where does thing sit right now? The next CC-20 board revision is just about ready to be implemented. I’ve had to move to a DDS with a higher master clock frequency and change out the product detector from a dual-gate MOSFET to a diode-ring mixer. One advantage of the new DDS is that I can greatly simplify the transmitter circuitry, but this will require the trade-off of a fairly significant revision of the PCB. I have been getting my PCBs manufactured in China, and right now many of the manufacturing firms (my board house included) are shutting down for two weeks to observe the Spring Festival (Chinese New Year). So even if I do send my Gerber files to the board house, they probably won’t be back for at least a month. In the meantime, I’ve decided to work on a side project that’s been rattling around in my head for a while: a QRSS/CW/Feld Hell/Etc. beacon. Also, in response to a lot of positive response that I have received from my simple Twin-T code practice oscillator, I also spent a few days revising the circuit to make the output a bit more robust and then created a PCB for the circuit in Kicad so I could transition my EDA to an actively developed software package (I was using TinyCAD/FreePCB previously, which seems to be pretty much a dead end). So allow me to tell you a bit more about the beacon project. For now, I’ve decided to dub it OpenBeacon (I know, so very original). But there is a decent reason for the name. Much like the CC-Series, I intend for this project to fill a niche in the market that is very empty right now. The list of notable open source/open hardware kits out in the market is very small. The only one I think of off the top of my head is OpenQRP. 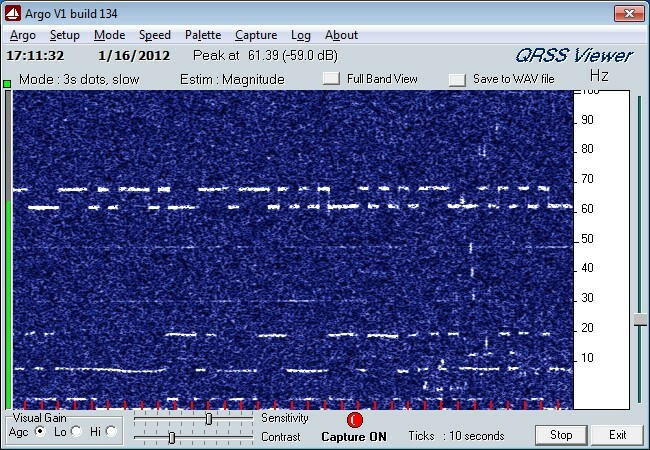 As far as QRSS kits, I’m only aware of the one from the talented Hans Summers. My goal for this project is to provide a kit that is open, extensible, relatively inexpensive and simple, and ripe for user modification. Let me tell you a bit more about the project specs and how they fit into this goal. Let’s start with the bare hardware. The transmitter is a standard, vanilla Colpitts oscillator followed by an emitter follower buffer, which feeds a class A PA with fully adjustable output power (provided by a very cheap and cheerful part, the BD139). 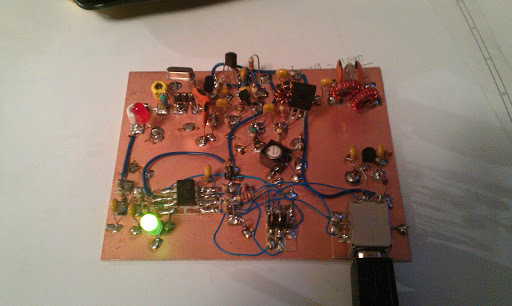 At full-bore with 13.8 VCC, the transmitter can put out about 300 mW into 50 Ω. The brains of the operation is an Atmel ATtiny85 microcontroller. The way that it interacts with the transmitter is via its PWM output, which can generate a voltage from 0 V to 5 V after proper filtering. This control voltage is fed to a reversed-biased LED which acts as a varactor to tune the oscillator in very tiny amounts (< 10 Hz). The PWM output is essentially an 8-bit DAC, so not only can the varactor be flipped between 0 V and 5 V, but it can be set to many intermediate values, which allows for things like Feld Hell and just about any kind of graphic or glyph you can think of to be transmitted. The transmitter PA is also keyed with a PNP transistor which is controlled by the ATtiny85, which allows the OpenBeacon to operate in standard CW beacon mode. The main way in which this project will meet the goals I stated above is in its user interface. There is a handy open source project called V-USB which gives USB interface capability to AVR microcontrollers that do not have USB built-in. This allows me to wire a USB port to the ATtiny85 and have the V-USB firmware take care of all the ugly business behind the scenes so that I can focus on interfacing the OpenBeacon to a PC. With a simple command line program, the user will have the ability to switch between the many operating modes available, set his own callsign and beacon message without having to have the microcontroller programmed for him, upload custom glyphs to be transmitter, and monitor the status of the beacon. No need to mess with jumpers or in-circuit programmers (although the ISP port will be available for those who want to hack their OpenBeacon). The client program is written in C and should be able to be compiled for Linux, Windows, and OS X machines. Right now, the prototype is pretty much complete save a few minor tweaks. Yesterday, I got the code for the CW modes completed and put the beacon on the air in DFCW 6 second dit mode just above 10.140010 MHz. Conditions weren’t great, but I did manage to get a few weak captures on the KL7UK grabber and one from KI6FEN via Twitter. The signal was way too wide and extremely drifty, but I’ve solved those problems by changing the coupling capacitor between the LED varactor and the oscillator and by creating a rudimentary thermal chamber for the beacon out of pink antistatic foam. I’ll be leaving the beacon on for the next few days when I’m not working on the project (which will be most of the day). Any reception reports would be greatly appreciated! So the plan is to get the CC-Series PCB revisions hopefully done by next weekend so that they can be sent off to the board house before their vacation is over. In my little bits of downtime, I’ll continue work on the code for the OpenBeacon. The plan for this project is to get the PCBs cranked out very quickly. Now that I’m familiar with Kicad, I think it won’t be too difficult or take too long to design the boards. I’m also going to be trying out a new PCB vendor which promises much cheaper prices and faster turnaround times on smaller boards such as this. With any luck, I can fast-track OpenBeacon testing and production and have it out while the CC-Series is in it’s final beta test. Stay tuned, this is make-or-break time! Why PCBs made in China??? Does anyone is USA do this? Why are your PCBs made in China? Does anyone in USA make PCBs? Just wondering! There are a few places in the US that manufacture PCBs, but they are getting pretty scarce. I do have some sensitivity to the issue of offshoring. One of my first jobs out of high school was working at the local PCB factory in my hometown of Dallas, OR by the name of Praegitzer Industries. Dallas is a pretty small town, and at the time that I worked there, I believe that the factory was the largest employer in town. A few years after I left there, the factory was purchased from its local owner by Tyco. Then a few years after that it was shutdown. More recently, I was witness to almost all of my colleagues at Tektronix in the manufacturing areas (Bldg. 19) get laid off as their jobs were sent to the China plant. I don’t enjoy that happening, but there’s at least one reason cited by management that made a lot of sense to me. The “center of gravity” of electronics manufacturing has shifted almost completely to China. Just about every supplier is either in China or close by in the Asia-Pacific region. It does make a lot of logistics sense to have operations close to all of the supporting infrastructure. In my case, I’m operating on a shoestring budget and have to get the absolute most bang for my buck. The last batch of PCBs which I had made (the code practice oscillator) cost me a grand total of $9.90 plus about $15 shipping for 10 boards. On the batch of boards that I had made before that, my setup costs alone cost 5x that much money. I have yet to find any domestic operations which cater to hobbyists and small businessmen such as myself, and can offer that kind of an inexpensive rate. Such low costs on prototype boards means that I can iterate my designs much cheaper and quicker than I could in the past, which means better product development and less chance of me blowing hundreds of dollars if I screw up something in the PCB design (which I did a couple of times in the past as I taught myself PCB design). If and when a domestic operation ever gets close to this kind of price point and can offer the same kind of convenience in ordering, then I will be happy to use them. Unfortunately, right now I haven’t found such a place. As I see it, the only way we can turn the clock back on the issue of offshoring is if large numbers of Americans decide that they are willing to pay significantly more for their products, or collectively agree to a much lower minimum wage.